Na Nach Nachma Nachman Meuman: Even a plank will do! Even a plank will do! What do we learn from the fact that the great Moses sent the heads of tribes on a mission from him and they were unsuccessful while the lesser Yehoshua sent two "planks" and they were completely successful? One thing that is demonstrated is the importance of the heart...how connected is a person to the essence of their mission. Perhaps, but the "planks" claim to fame is in part good stuff like that they chose the right prostitute and they hid well behind planks. The numbers that reappear here are two and ten. The error of the first spies is so great that the only solution left Gd was genocide. The decree was not reversed it was just spread over four generations so that the sins could be absorbed and atoned for by different people without extinction of Israel except for the tribe of the Levite. A new division of Israel appears. 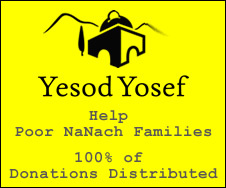 Not into 12 tribes but into three: Yehuda (because he had a heart), Yehoshua (tribe of Efraim the elder of Menashe and as a student of Moshe and being born in the Nile, Yehoshua was the true leader of the house of Josef). The Levites which are a tribe that specializes in maintaining law and order and collecting the tiths. Rabbi Nachman brings forward a new fact: Without Rabbi Natan he is nothing and likewise without Rabbi Nachman, Rabbi Natan is nothing. This is the first and last time such a claim is made by a gaon hador. Moses without Yehoshua is in fact nothing and people from his family, Ahron, Miriam and Korach would have brought calamity on the nation. Therefore Nepotism is out. A Breslever without a student is dead, is nothing. This is what the story of the spies teaches us. That falsehood is punishable and no family ties can overcome this. Attachment to the true tzaddik is the only thing that matters in the end.